A rustic newlywed sits within the cool precincts of her mud home. It is the height of summer, and she has just emerged from her bath. She has draped the white and gold-bordered saree only partially on her barely dried body, probably owing to the heat. 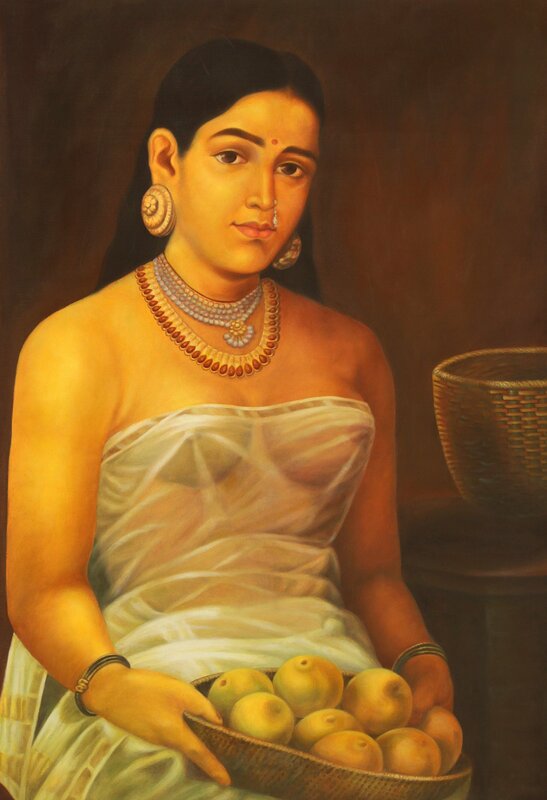 She was in the middle of her shringar, and had just put on a clutch of necklaces and some studs on her lobes when she must have remembered the basket of fruits. Yet to put on the all-important sindoor, she swept up the fruits as she glided across the courtyard. As she entered the kitchen, she was struck by the strangeness of her surroundings. She paused and sat down on the nearest stool, staring out into the distance. This lifelike oil captures the essence of bridal sorrow, an unhappiness so ungovernable that dharm has assigned it to be borne by the woman. The figure you see in this painting is of a nubile woman, married off by her parents into probably a village like theirs some distance away. Her mouth is pursed; pensiveness, writ large on her beauteous brow. For probably the first time amidst the bustle of her new duties, she has had a moment to herself. How far away she is from everything she has ever know or that has made her who she is. She is glowing in the quiet afternoon light that has stolen into the kitchen. Any moment now the turmoil within her would come out in a torrent of womanly tears.